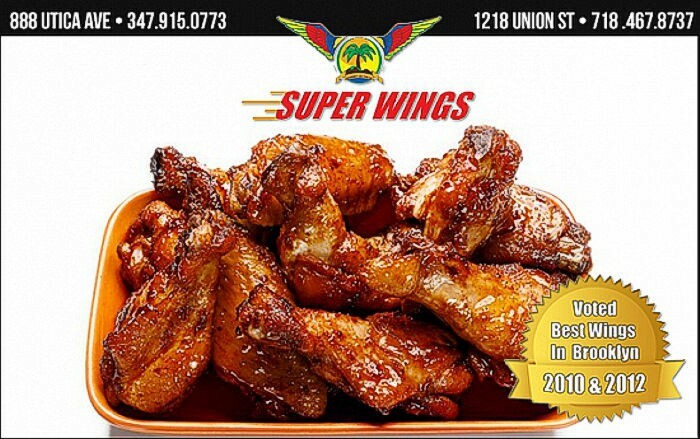 Super Wings Brooklyn, NY 11225 | No wing like a SUPER WING! At Super Wings bring the Caribbean to BROOKLYN! For years now, we have been the right address if you want to experience the Caribbean attitude towards life. Our events are known far beyond the city limits and our cooking is a culinary pleasure! We are dedicated to EXCELLENCE in all that we do, as our goal is to showcase the Caribbean at its very best! Voted Best Wings in Brooklyn! The most unique flavors you have ever tasted on a wing is available at Super Wings NY. We specialize in tantalizing your taste buds with the Caribbean's answer to the wild Buffalo Wings craze sweeping the nation. We use wings recipes with a spectrum of flavors so amazing, they have been voted the "Best Wings in Brooklyn" 1st Place winner 2010 and 1st Place People's Choice 2011! These wings are SO DELISH they even slayed Iron Chef Bobby Flay in a Spicy Chicken Wing throw-down! Each of our wing sauce recipes are a secret blend of Caribbean herbs and spices so delectable they are reviews as the top recipes for wings on the internet. There is truly no wing like a SUPER WING! and we want to share them with you!